Designer Gets Creative With His Resume, Makes a Game Out of It | OhGizmo! By Hazel Chua on 11/05/13 • Leave a comment! It’s a tough world out there and jobs are hard to come by. You could post the usual resume that lists all of your skills and credentials, or you could show potential employers what you’re made of instead. 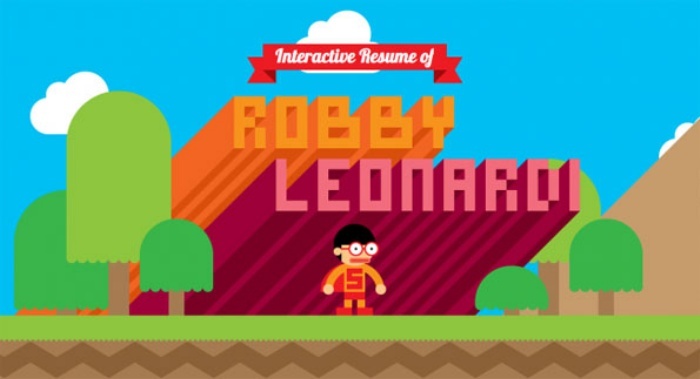 The latter is what designer Robby Leonardi chose to do with his interactive resume. The entire thing plays out like a video game, complete with stages and levels that let you know what Robby is all about. As others have pointed out, the only thing missing is the boss level. The resume ends in a contact form where you can send Robby a message and even offer him a job or two. Check it out here.